Burlap - I used scraps, so I'm not sure how much. Sewing machine, pins, tan thread, and other sewing supplies. Buttons, fabric strips, or other embellishments. 1. 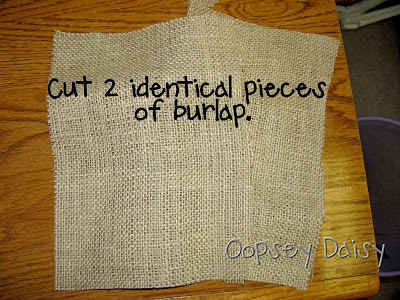 I cut 2 pieces of burlap. I did not measure, but I tried to make my pieces tall and long. 2. I cut a "V" shape in the top of each piece for the bunny's ears. Then I matched them up and pinned. 3. 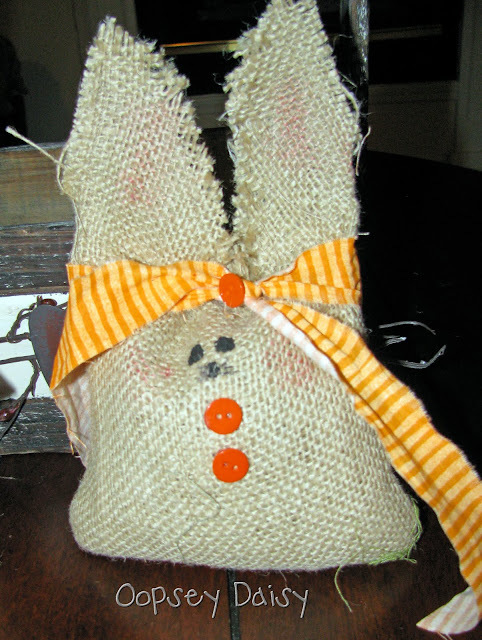 I sewed up a little bunny sack to stuff with dry beans. I did not sew any part of the ears yet. So I started just across from the bottom of the V (does that make sense??) and sewed 3 sides and stopped, leaving plenty of room to sew up the ears later. Hopefully the diagram helps make sense of that. 5. Alright, ladies. 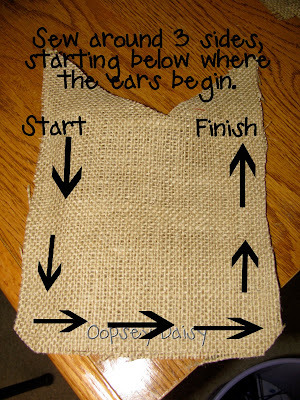 If you are extremely talented and have a very capable sewing machine, you could attempt to sew gathers in burlap. I broke off a sewing machine needle trying to do this. 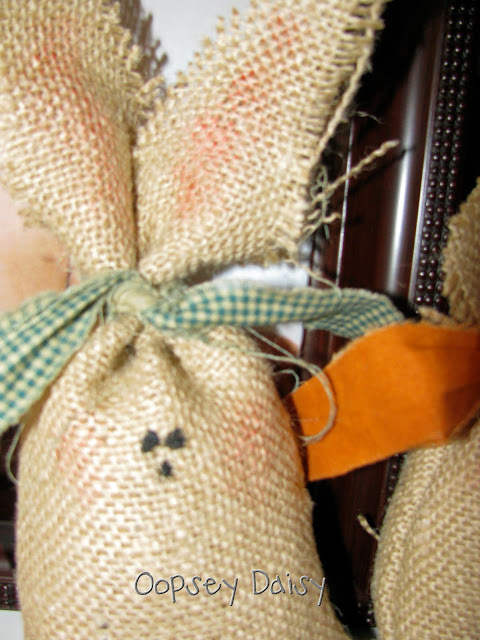 So plan B: I sewed straight across the top of my bunny sack and used my ribbon/fabric scraps to gather them. Then I sewed around each of the ears and trimmed them to my liking. I love that my tan thread was virtually invisible. 6. Paint and embellish. I painted the faces using black acrylic paint. I realized that painting the face lower than I might think turned out the best so it didn't get lost in the "scrunch" when I gathered it. Using a find Sharpie, I added a few details like whiskers. I used pink distressing ink (I think it was called "Worn Lipstick") to add a little blush to the bunny's cheeks and the insides of his ears. Embellishing was the fun part. I bought NOTHING for this project... just used all scraps and stuff around the house. I love scrap projects!! Ta-dah! I found this cute basket and threw in some Spanish moss. These three pals are on my mantel. Meet Bunny-zilla. I wanted one fat bunny, but I guess I went a little overboard. There are still 2 more that need finishing touches. I went bunny-crazy for sure!! Oh these are so so so cute!!! Absolutely Darling!!! I saw these there too and loved them! I have been wanting to make these! Thanks for the tutorial! You are so cute! I love the things you come up with. I am having a St. Patrick's day party next week with some friends. Can you please send me your idea's? I am having a hard time coming up with something fun to do! Please HELP!!! Love them!!! So creative…and I love your disclaimer…I know there is ALWAYS an easier way to do the projects I tackle!!! Haha!!! 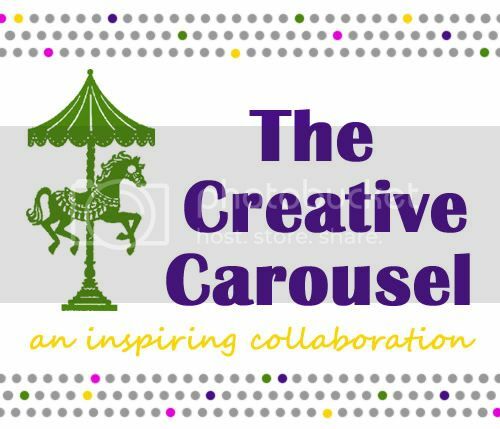 You were featured on U Create!!! Way to go! Yay!! I'm glad you did this tutorial!! I've been meaning to figure out how to make these, but now I can just follow your directions! I was just going to sit down during nap time today and try to figure these out. Now I don't have to recreate the wheel. Thanks so much for sharing. 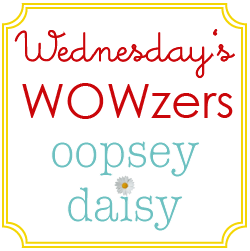 I just happened upon your blog. Very cute ideas! Wow! This makes my day!! Thanks everyone for your happy comments. It is not often that I fall off my chair looking for a pen and paper to catch ideas. I did this time. The bunnies are soooooooo cute! I want one! I will be making them this weekend for sure! These are adorable! I can't wait to make some! 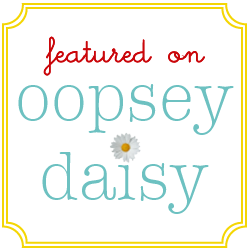 I just came across your blog and I LOVE it! So cute – I'm going to have to make me some! I'd like to invite you over to my first blog linking party tomorrow (Friday). Come plant a creative seed at Punkin Seed Productions "Plant a Punkin Seed Party"! Very, very fun!! They are adorable!!! Thank you for the how tos!! Oh these made me smile!!! So adorable. 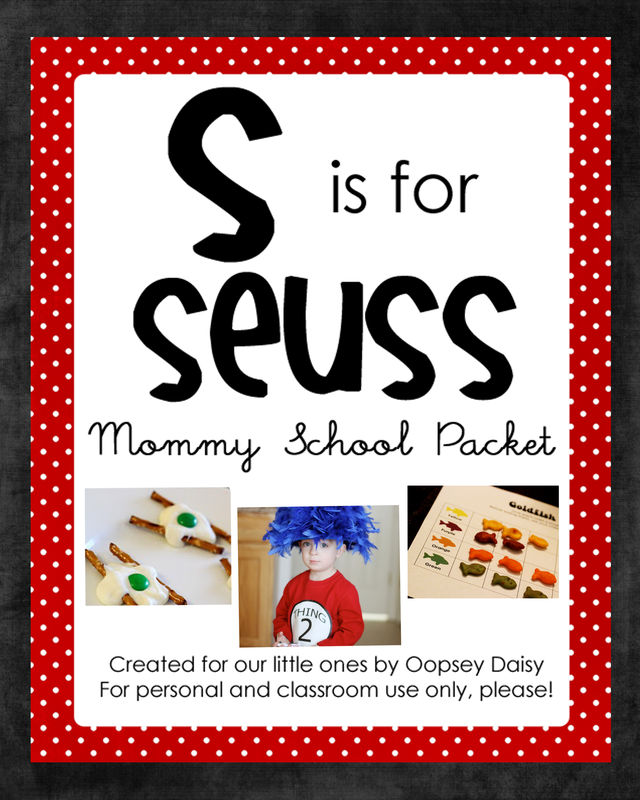 Going to make these for my nieces. Adorable! 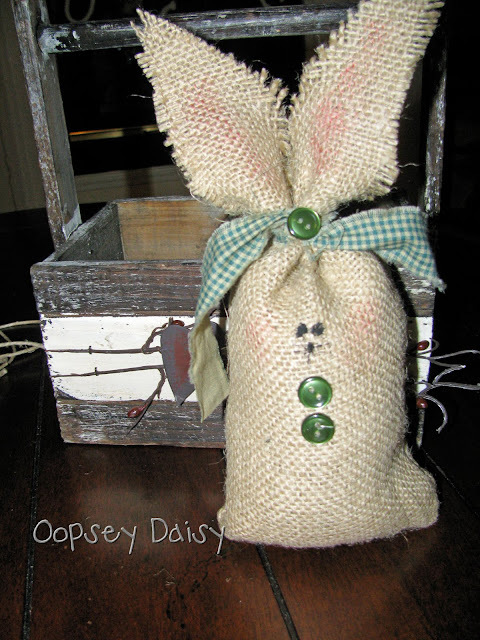 I love burlap…I love bunnies. These are too cute. I just saw some burlap carrots…I want to try that too! These are ADORABLE!!! You did such a great job! Thanks for participating in my link party!! Adorable! 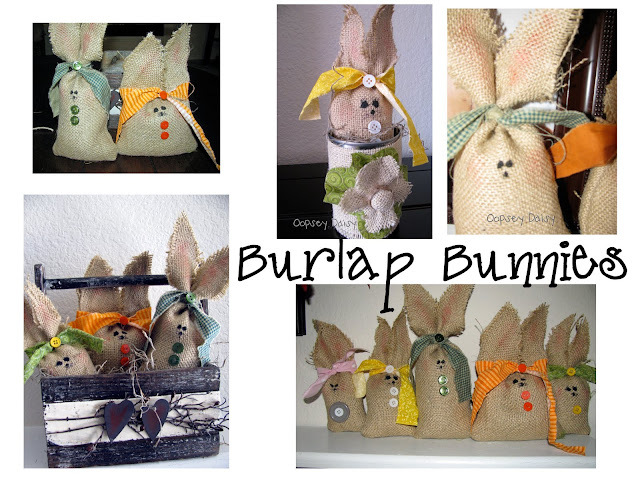 Bunnies and burlap are a great combo! 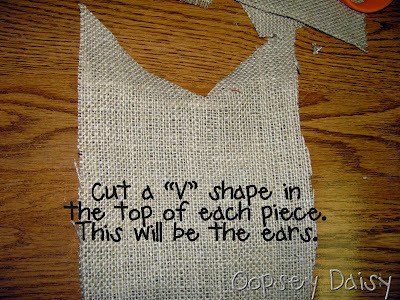 I have some scraps of burlap that would be perfect for this! Thanks for the tutorial! so cute! may have to make some of these soon! These are SOOO cute! I love them!! I am going to feature them as part as the Spring has Sprung Party on Fun to Craft. Stop by in a few days to grab a button. 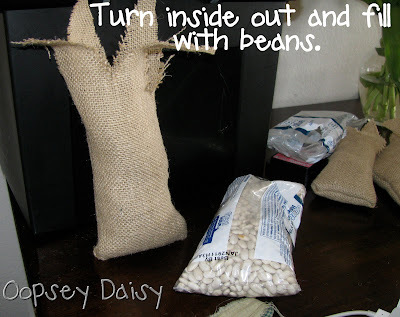 Alison- I love them!I saw this at Green Bean's and I am so glad you figured it out 🙂 Thanks- now I don't have to- hope I get time to make some. Yours turned out darling! Very cute, I made my own version, but I am linking back. Thanks for the idea! These are so cute! 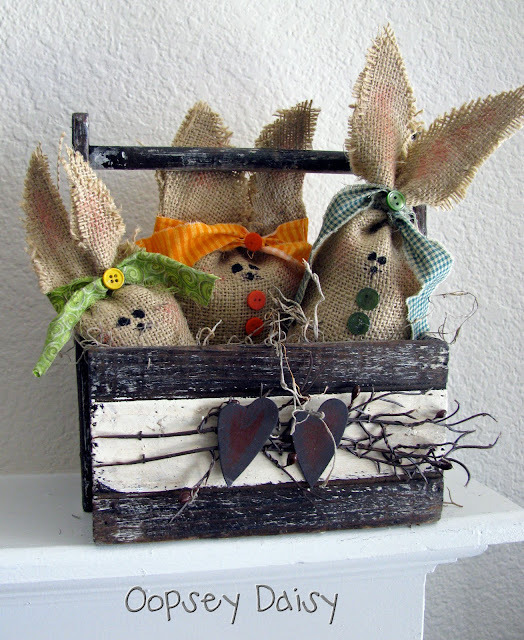 I included these on my blog today for fun Easter Crafts with tutorials. Can't remember which linky party I first saw them on. I think we frequent many of the same! Thanks for sharing!! You've been featured at Punkin Seed Productions! Come grab your button!!! These. Are. So. Cute.! I just had to follow you!!! Come check out my bunnies – I love them! What a precious idea! I love them! So cute. check out my bunnies. Thanks for the tutorial. How stinkin cute are those?!! Love them! how clever. I'm so glad you joined the Easter Roundup! Super cute and super easy!! I linked your tutorial to my site and included pictures. Thanks for the tutorial! These are the cutest thing ever. I may just have to break out the sewing stuff today. Thanks for the great idea. Why not fill these cute lil bunnies with candy instead of beans. What a cute idea! Even a year later we love it…thanks for keeping it here. I love these, and made tons a couple years ago. Thanks for the tutorial! My mom passed away last year and I found a cute little burlap bunny sitting on her nightstand. So thankful, I made one especially for her and she treasured it. Alison, these are so cute. I love how you can decorate each one differently, and make a few at a time. 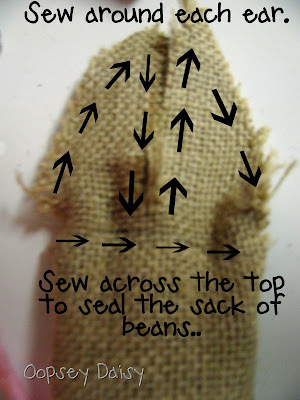 Perfect for left over burlap scraps and all the saved buttons I have. These are insanely cute, love them! Amanda recently posted..Lost Keys Come Home, Maybe! I love these! Too cute! Love using the burlap! Happy Easter! I was wondering if you could tell me the size of the burlap…I was not sure if it was square or rectangle. Thank you-so very, very cute! I love them! Going to try them this week! !